This fairytale pumpkin was absolutely gorgeous outside and inside. The inside flesh was a kind of vibrant orange that almost looked fake. Stunning. A lot of pumpkin soups call for a base of celery, carrot or potato and others call for a glug of cream. I opted for a simple roasted pumpkin soup (mostly out of laziness of going to the store to purchase said celery/carrot/potato), with the staple onion and garlic and a few spices to kick off the fall season. No swirl of cream. 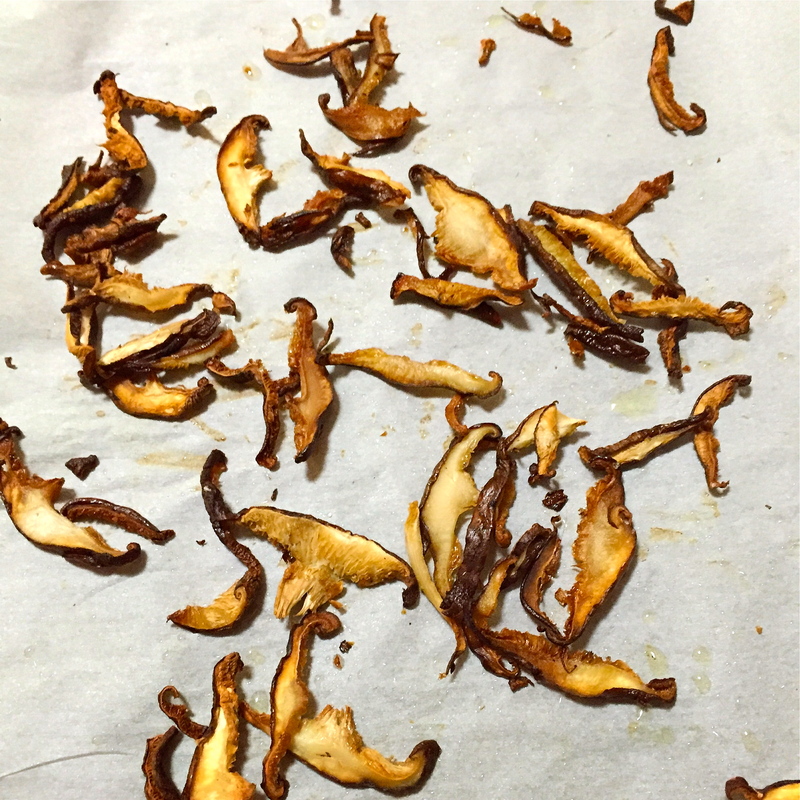 To top the soup, a few crunchy and savory roasted shiitake mushrooms, or as some like to say, shiitake “bacon.” Ooo roasty shiitakes are so dang good you NEED to make them. I first had shiitake bacon at by Chloe. in the West Village on top of the mac n’ cheese and stirred into the kale Caesar. Shiitake bacon is clearly great with everything. Sorry regular bacon. Rub the pumpkin flesh with 1 tablespoon olive oil, place on a baking sheet and roast for about 35 minutes, flipping the quarters halfway through, until the flesh is soft and can be easily pierced with a fork. Let cool for 2 to 5 minutes. Meanwhile, heat 2 tablespoons olive oil in a large pot over medium high heat. Add the onion and saute for about 5 minutes or until just translucent. Add the garlic and cook for about 1 minute. Add the salt, spices and black pepper and cook for another 1 minute more. Once the pumpkin is completely cooked, peel off the skin and add to the soup pot. Add the vegetable broth or water and stir. Bring the mixture to a boil, stir, then reduce heat and simmer for another 10 to 15 minutes. Turn the heat off and let the soup cool for 2 to 5 minutes. Using a stick or immersion blender, puree the soup to desired thickness. Or, in batches, transfer the soup to a blender or food processor and puree. 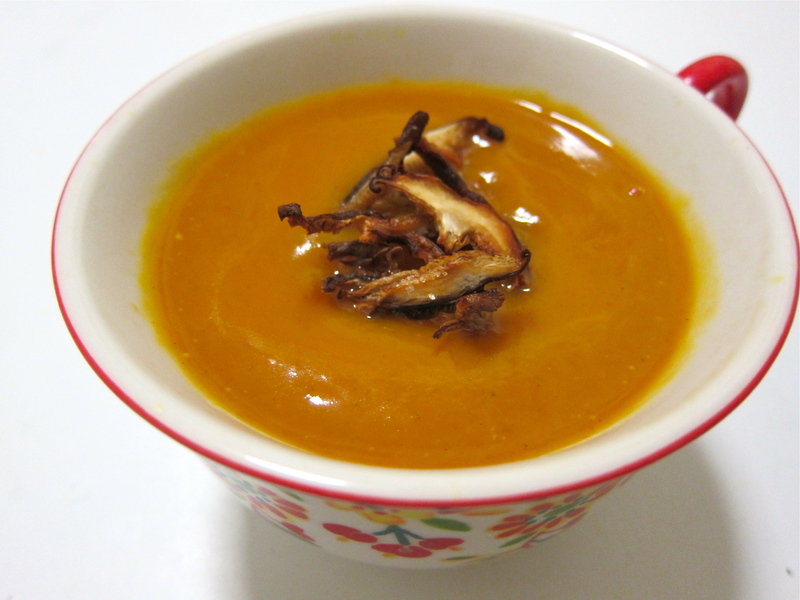 Ladle the soup into bowls and serve with toasted pumpkin seeds and shiitake “bacon” (recipe below). Slice the shiitake mushroom caps thin and toss with olive oil and salt. Spread onto a baking sheet and bake for about 15 to 25 minutes, or until the mushrooms have shrunk and are golden brown and crispy (but not too crispy).